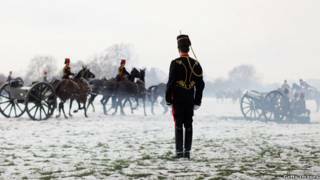 Image caption A soldier of the King」s Troop Royal Horse Artillery watches the world go by in Hyde Park. Photo by Oli Scarff. My sister loves sitting on her balcony. She sits there for hours watching the world go by. I didn't read my book in the cafe. I was just watching the world go by. He really cares about his girlfriend. She means the world to him. Thank you for helping me with my essay. It means the world to me!